We believe prayer is a vital part of everything we do in church. As we pray and spend time talking to God, waiting on Him, we get to know God’s will and align ourselves with God’s heart. 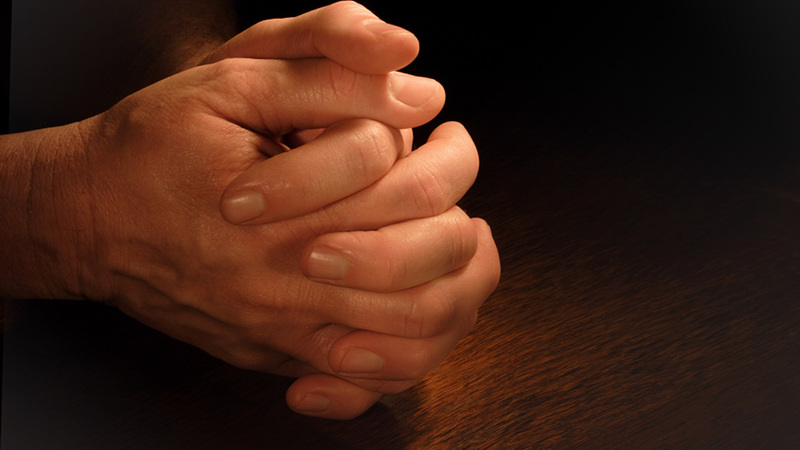 Prayer is firstly personal, but also corporate, so we encourage both. Where to begin? Personal, individual prayer is the life blood of our relationships with our father God. Imagine you were in a human relationship and you never spoke, or communicated to the other person in any way. Also imagine what it would be like never to listen, read, or hear the other person communicate with you. Prayer is two way personal communication with God; we speak to Him and He answers us. Just as we are all different in our relationships with other people, so we are all unique in how we communicate with God and how we hear or sense Him communicating with us. Just as a child learns to communicate with others, so we too must learn how prayer works best for us. As church we can provide helpful teaching and guidance on how you might try to pray, but we can't pray for you, that is something you have to do for yourself. Why and how should I pray? is one of the topics we cover on the Alpha Course, so if starting a relationship with Jesus and learning how to pray is something you want to know more about, why not come along to the Alpha course. We also encourage the use of the Try Praying booklet, which leads people through the prayer process and helps them get to 'Try Praying'. Pick your copy on the Welcome desk on a Sunday and try it out. Spending Time with God Setting aside time to be with God is a key component to developing a healthy personal prayer relationship. How that works for you, only you will know. Many say starting the day in prayer is the best way, but that may not work for you, maybe your shift patterns or children's sleep (or waking) patterns just don't make it possible. But in all our days, there will be time, to be quiet with God, if we make it happen, even if it just a couple of minutes between nappy changes. Intercession Intercession, is as its name suggests interceding for and on behalf of others, to God. In other words it is bringing the needs of others before God. God places a high priority on praying for others and so do we. We are called to Love God, Love People and part of the expression of that love is that we are willing, individually, and corporately to pray for them, to intercede for them. It is something we are all called to do. 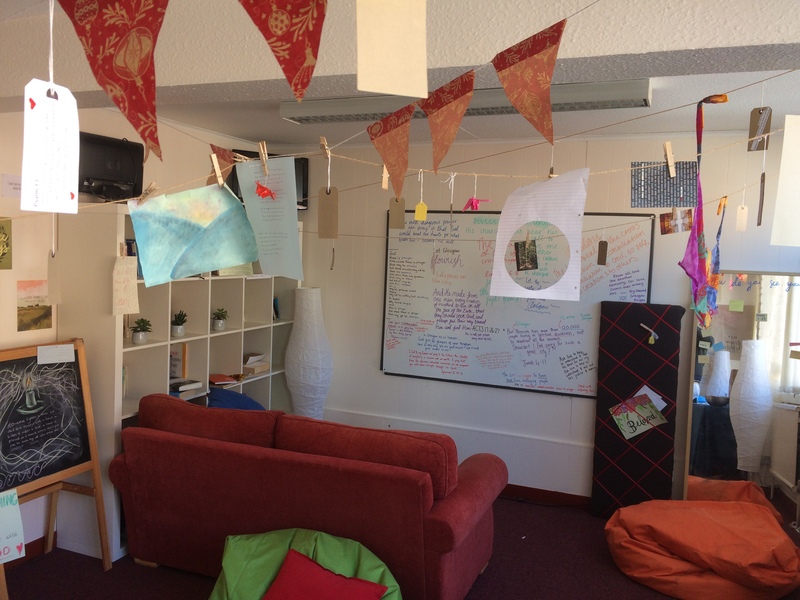 We want to encourage and help facilitate prayer for others, through our small groups, praying not just for its members, but also those in the wider connected community of friends, neighbours and colleagues of the members of each group. The Bible is clear that we are called to pray together. There is something uniquely powerful when people gather together to pray. Sunday Services Our corporate expressions include prayer meetings before Sunday Services and during the week. After Church on a Sunday and during our small group meetings we have time for people to pray with each other, called 'ministry time'. 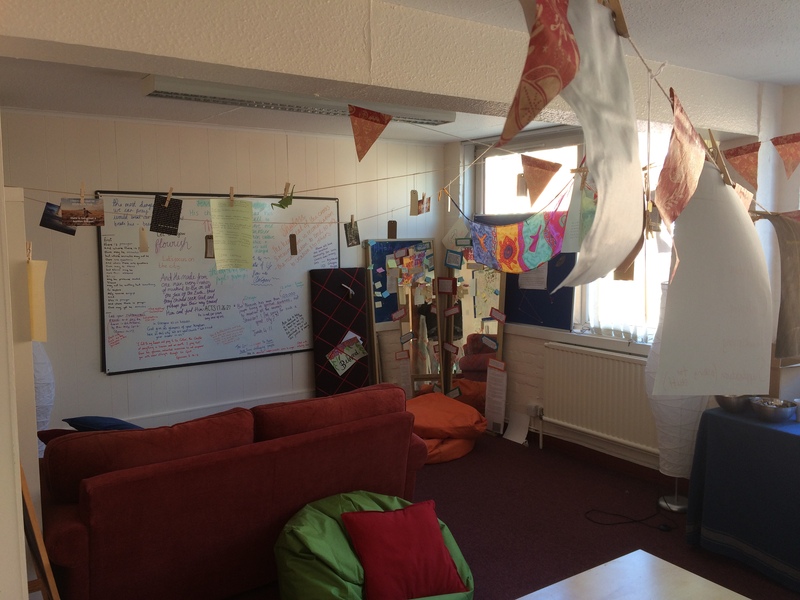 Here we pray as a response to a prompting from the Spirit and to address individual needs. Wednesday Prayer Meeting Usually on the second Wednesday of every month we have a corporate prayer meeting where we pray for different aspects of the Kingdom each month. 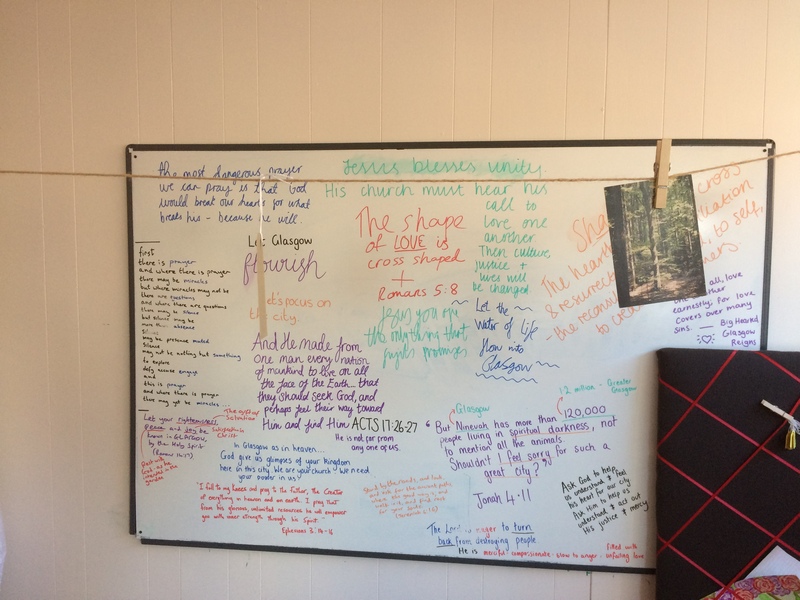 Prayer Diary To help people join together to pray during the month, we have a Monthly Prayer Diary, which has the same focus as our monthly prayer meeting. Small Groups Our Small Groups meet weekly and are places where people pray together and for one another, and where individual prayer and intercession is encouraged.  'In Glasgow as it is in Heaven' 'In Glasgow as it is in Heaven' is a new prayer partnership between ourselves, Just Love Glasgow and other local churches to pray together to see God's will be done here in Glasgow. Launching with 5 days of 24 hour prayer in early March 2018 over 70 people from at least 7 churches joined to pray in the Prayer Room at the Vineyard Centre. The aim is to see more such events and encourage people across the city to pray together.